These stories are always great to listen to. Sometimes, they touch you in a deep and meaningful way. More than a few have floated around in my head for days after I listened to it. This is worth your time. Can you archive them? There are too few to chose from! Can't get enough of these stories. This podcast gives me an opportunity to suppress the clamor of worldly events for a few minutes so I can re-visit my principles and priorities. I'd prefer a slightly shorter episode with a minimum of introduction so I can focus on the author's essay. It still deserves a 5-star rating; check it out, pass it forward. I enjoy listeing to this podcast, and especially like the older ones. I have one complaint and I really hope someone reads this. Dan Gediman sometimes has a nose whistle and it's really off-putting. This podcast is by far my favorite, the essays are completely inspirational. I love listening to these thought provoking statements of personal belief. They help me stretch my perspective. The 50's broadcasts are superb. On the other hand, the modern commentary and self-promotion are ham-handed and off-putting. Unfortunately, the latter consumes more than half of each podcast. We read these essays for a school project. I really enjoyed listening, and thought I should try to hear them all, so here I am downloading them from itunes! . in this I believe. It's a wonderful reminder we are all connected through our humanity and our ability to believe in something greater than ourselves. So sad to see it ending. why are there only two? I actually have to do my final essay for an AP class on this project for NPR. It would be amazing if I won an award for it, extra credit is always good. I believe that Stephen Colbert is more then Opera. By more I mean better, and by better I mean less real, and by less real i mean more real. It is confuing I know, but I do believe. I look forward to hearing more in other's beliefs. I use this podcast in my middle school languauge arts classroom. This podcast provides excellent examples of different points of view. The titles give stimulating writing prompts to use in lessons. These fluffy stories are not up to the higher standards I expect from NPR. We are already surrounded by psudo news and it is unfortunate that NPR has jumped on the bandwagen. I am glad that NPR decided to post a podcast as inspiring as this one. I like listening to this podcast because I know that people voice their opinions and let the world know! The past few weeks - months actually - at work have been frustratingly hard. We are going through a difficult stage with layoffs/reorg, and I have to admit I have been very negative in thinking and performance. 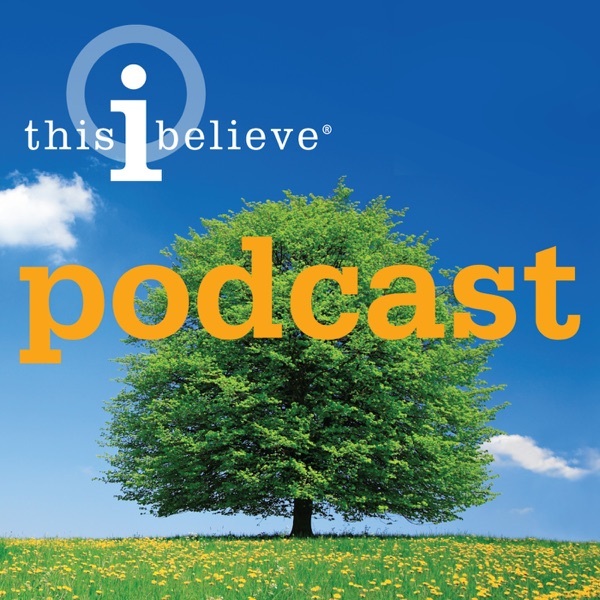 I was leaving the train station and caught this NPR segment of "This I Believe" . It changed my entire perspective on life and work – not in that order. It's nice to hear how other people face, deal and overcome obstacles that internally challenge them each day. I think it will all just get better, work and life -in that order. In English (still in High School), we are supposed to write an essay based on our personal beliefs.These can range from the signifigance of sleeping in on Saturdays, to the reason we wake up in the morning. Our teacher uses these essays to give us inspiration, to show us what we can write about, that is how got turned on to these. These essays are from everyday citizens, famous or not (not that it matters). Either way, these essays are really a thing to listen to. I would recommend them to anyone who really enjoys studying beliefs, or has one of their own. Being NPR, these short pieces aren't going to be about anyone's mainstream religion as that would go against the NPR rule of ignoring (or mocking) the beliefs of most americans while treating foreign religiosn (such as Islam) with more tolerance and evenhandedness than they deserve. These pieces are simply little observations. No one really guides their life by the nonsense here ("I believe in the power of laughter" (a meaningless statement - yes, laughter is fun but it hardly can serve as a foundation for ethics). "I believe in a child's smile" (stupid and sentimental). Silly and empty. Every Monday I look forward to hearing the essays from people around the United States on just about every topic you could think of. Sometimes it is just some simple about life, and sometimes it is something very complex and serious. I never know who I might hear next and what they might be talking about. I believe that this makes NPR's "This I Believe" possible one of the more fresh shows week after week. When fifty-two people write an episode per year it really keeps the show from going stale. I would recommend this show to anyone. I look forward to Mondays! I believe this is a nice way to beging the workdays: by connecting to people's spirit. Thank you! I discovered This I Believe in my Freshmen Composition class at Xavier. My professor wanted the class to write our own essay as our final paper. Seemingly easy enough, right? Wrong. It proved to be much harder than I expected, but I found inspiration in the essays that others had submitted to the online reserve. After finishing my own essay, and getting an A for the grade in class, I submitted my own among the vast complilations available for all to read. I love this podcast because I can not find the NPR channel for my area on the radio, but I can still listen to a new essay every week. Thank you so much for providing these podcasts, and to mayone who has never listened, I highly reccommend this podcast. It is inspiring! One of the best motivators on a dreary day! I just got the audio book as a gift. Phenominal series, extraordinary book. It really lets you beathe in some fresh air on the daily hustle and bustle of life. This motivates me to be a better person in 2007. To get better you have to do better....this I believe! Oral history is such a lost art - or at least it is in the mainstream. Granted, NPR is not as mainstream as CBS but i feel that this effort will reach many more listeners than other efforts that simply don't have the power to bring it to the masses. Anything from NPR is quality but this one is simply great. Check out "This American Life" podcast (from NPR as well) if you you enjoy this. I have found this podcast an excellent continuation of Mr. Murrow's radio show. When listening I am reminded of the common strain that binds all humans to each other. I love this podcast. I found out about it on NPR. I can't get enough and have shared it with several of my close friends. This podcast is a series of short essays by people all over the country who share their personal positive experieces. It really makes me appreciate...people. I hope you like it also.